COLORADO SPRINGS, Colorado -- In the service of journalism, we are taught early and often that the thing to do is put our emotions far, far away. Too often, though, this does everyone a grave disservice. Life is about the relationships we build. With those relationships comes all the good stuff and, when someone dies, all the hurt that goes with it, too. Chuck Wielgus passed away April 23, two Sundays ago. He was 67. When you've known someone for some 20 (or more) years, like Chuck, there's that hurt. For his family and for everyone who knew and assuredly not just liked but loved him. It hurts that he's gone. At the same time, Chuck was one of those guys who held for a great many people a very special place in our world. Too often in journalism, those people don't get the chance to say what should be said about a guy like Chuck -- to tell the rest of the world about his fundamental decency, his essential humanity, how someone like him sought, of course imperfectly, to make a difference. Chuck Wielgus made a difference. A memorial service for Chuck Wielgus will be held here Wednesday. There will be only a few speakers at that memorial. Here, then, is where journalism can be of real service. This is what a great many people wanted to say about him. He was always writing notes at his desk. Always. He’s reading USA Today and writing a note to somebody. That’s how I see him. He died [on a] Sunday morning. I was so fortunate. I got to see him Saturday night. It was really meaningful. Really powerful. Being around people who are dying can be tough. But it’s so meaningful. … Over half his time here he was sick. He was diagnosed in 2006. For 10 1/2 years he had this chronic illness. … The job added years to Chuck’s life. He loved his family. That’s clear as day. He was passionate about the cause of USA Swimming and leading the organization. It’s a cause. When you work for a cause, passion is easy, especially if you believe in it. It gave him focus and kept him living. I had 100 percent assurance in my mind that was true. It gave him purpose. If he was feeling rotten, if he had just had chemo, if he was in pain, whatever rotten thing was happening that day — getting dressed and coming to the office and spending it here was therapeutic and life extending. To me, I think it added three or four years to his life. [His wife] Nancy said, I think it added more. He always knew what would grow his sport. In advance of the Beijing Games, when swimming was scheduled to be shown live in the morning USA time, I called Chuck secretly to tell him we were on the verge of getting the IOC, FINA and the Beijing organizers to agree to move the swimming finals to the morning, which would allow them to be seen live in prime time in most of the U.S., which in retrospect was great … he immediately recognized the possibilities. Over the next few months, he touched bases with all our top coaches. As a result of Chuck’s quiet diplomacy — it never got out — it made swimming, in my estimation, the No. 1 sport in Beijing, as far as American interests were concerned, and it probably elevated swimming worldwide to the level of track and field. A lot of that had to do with Michael [Phelps] — Michael being on in prime time in our country made it even more of a phenomenon. … The other point I’m trying to make is that everything he ever did, he did quietly. He was just one of those great executives who did not seem to be hunting for glory for himself. He wanted everything to be for his sport. … In the middle of March , it struck me that I had not talked to him in a month. I called. His beloved Nancy was driving. He was in the back of the car, going to this first session for this exotic new treatment he could get. You could hear the kind of pain he was in, lying in the back seat of the car, going over the bumps. Yet here was this guy who was still so positive. He was so positive about how much time he’d had and he was positive about how he was going to have so much more. He was more than a glass half-full person. I’m just going to set the table here quickly. From 1997, when Chuck took the position, until 2011, when I sat down with him in Phoenix, Arizona [to talk about the national team director job] … our total conversation was no more than five minutes total, combined. We just never crossed paths. … We sat down in Phoenix. We talked for hours. The first thing that came out of his mouth was, ‘What are your priorities in your life?’ I said, ‘Family, friends and probably my team.’Four hours later, I knew I probably was going to be offered the job; 90 percent of the conversation was about life, 10 percent about the job. … When I walked away from that four-hour meeting, I walked to the car and I said to my wife, ‘I would work for that man in a heartbeat.’ 24 hours later I accepted. In those four short hours, I realized this was a guy who was a very special individual and had values and standards anyone in their right mind would want to work with and for. No. 1, it’s crazy how Chuck’s tenure exactly paralleled Michael’s. I started coaching Michael on May 5, 1997. One of the things I was thinking was, I’m not sure anybody would have been as forward thinking about what happened when Michael became Michael. I think Chuck was the guy who helped grow the sport. The Olympic Trials events, the TV coverage, all those things — which Michael helped make better — without somebody thinking about them in the first place, it would never have been the same. The other thing, one of the things I always admired about Chuck — as successful as USA Swimming was, particularly internationally, as successful as Michael was — he always saw his role as being in the background. He gave complete authority of the technical program to the technical people. In the entire time that I knew Chuck, which is pretty much 20 years — during our million days of camps, he would say, ‘Anything I can help you with?’ — in 20 years, I probably sat in his office twice, for maybe 10 minutes at a time. He took me to lunch one time. To me, that is a good thing. He was never involved in the things that the technical people were supposed to do. I always respected that. That’s why it always worked so well. I've been around USA swimming for almost 40 years, many great leaders have come and gone, but Chuck Wielgus was a different kind of breed. He was a tremendous leader who always put the athletes first. My father was diagnosed with colon cancer so I know how incredibly painful and draining the process is to fight that battle, and to watch Chuck persevere through such an awful disease and still work so hard and represent USA Swimming is nothing short of amazing. He was the type of leader that every NGB would be lucky to have, but it was us at USA Swimming who were blessed to have such a selfless man at the helm. I first met Mr. Wielgus at an event shortly after the 2012 London Olympics. I was 15 years old at the 2012 Olympics and my two swims in the 800m free in London were my first two swims in international competition. During the course of my first Olympic experience, it became clear to me that we not only had a great group of Team USA swimmers in London, but standing behind us was a dedicated team of individuals and managers from USA Swimming who gave us incredible support. And after meeting Mr. Wielgus, I understood why. He cared. He exhibited those same qualities of caring and professionalism that were shown by others throughout the USA Swimming organization, and the success of the swim team and USA Swimming reflects Mr. Wielgus' excellent leadership over the years. My memory of Chuck is a simple one. When he asked if there was anything that he could do to help, he genuinely meant it. I don't recall many details but we were at the training center for one "typical" training camp and Chuck stopped in at the pool just to see how things were going. He of course asked if he could do anything to help. Mid-practice, I casually mentioned something (I even forget what it was). Well, it was taken care of the next day. I never heard from him about it, and of course it was done — no muss, no fuss. I'm sorry I don't remember the details, but I do remember that it was taken care of without any more questions or requests from me, and Chuck didn't want any credit for getting it done. Chuck is leaving a legacy that will be unmatched. With his vision and guidance, he took the sport of swimming in the United States to the great heights and popularity that we are experiencing today. The impact that Chuck’s vision has had on the last and current generation of swimmers has been absolutely incredible. Personally, I have experienced first-hand the transformation and growth of our sport from the moment Chuck took over as executive director and — it was a privilege. ... 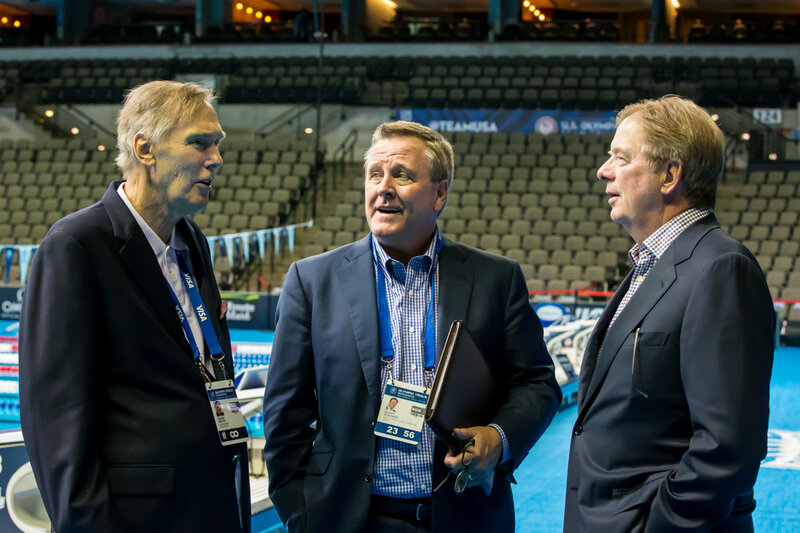 Under Chuck’s leadership, the model of excellence that USA Swimming has established is a gold standard that every other U.S. Olympic sport governing body is striving to be and it was an honor to be part of it. The great thing about swimming is when you have a kid there’s always a different role. Chuck saw the whole picture of our sport — not just the people who made him feel important and good. He saw the big picture. He did a fantastic job. He was one of the good guys. He will be missed. He was humble and thoughtful and gracious. I have never met a better man than Chuck Wielgus. Chuck has been both my professional colleague and close friend for the last 20 years. I have learned a lot about work and life just watching him interact with people. My whole family thought so highly of Chuck that when he asked me to play golf, permission from the home front was automatic. From time to time, I read Williams Bennett's “Book of Virtues” to my grandson. At some point in almost every story, I think of Chuck. He is humble, almost to a fault. After a close relationship with Chuck of 20 years, it wasn't until I was helping Nancy with his papers that I learned many of the honors he had received. I never heard Chuck brag. It was only when he was talking about his kids that he couldn't conceal the tremendous pride he felt for how they all turned out. He loved his family very much! Honest? OMG, incredibly so! Good news or bad news, Chuck always told it straight. In all my time with him, including dealings with some uncomfortable legal issues for USA Swimming, I never saw Chuck come close to finessing the truth. The only time I ever heard of Chuck being untruthful was when he told me that as a kid, he had to make up the sins which he had committed in order to have something to talk about when he went to confession on Sundays. Chuck was so intent on playing by the rules that you couldn't give him a 2-foot-putt – he insisted on holing it out. Chuck's tremendous success in business and in life emanated from the same common core. He was a great competitor – but he was always fair. He was both insightful and empathetic in his ability to put himself in the other person’s shoes. That made him a good negotiator and a very good boss and dad. It also meant that almost everyone who knew Chuck felt like they had a special relationship with him. His sense of humor didn't hurt that. Chuck had a contagious laugh and he often laughed the hardest when telling stories on himself. Chuck was insightful and intentional in planning for the future. That was part of his great success at USA Swimming, but it didn't stop there. The Saturday morning after he announced his planned retirement from Swimming, Chuck showed me the "Post Retirement Business Plan" for what he was going to do with the rest of his life, which he had been working on since dawn that day. I could go on and on describing Chuck's strengths and all of the lessons that I learned from him, but I will stop with one last observation. In my 45 years of working with some very smart people, I have never met a better communicator. Chuck was able to express himself in a way that left no doubt in the minds of others about his message and his underlying strength of character. I will miss Chuck, but my time with him was so rich and the lessons I learned so significant, that my memory of "Chuck's Book of Virtues" will always have a special place in my heart. Just an extraordinary guy. I had a weird thing happen. [The week before Chuck passed away] I was flying, that Wednesday, to California. Crappy weather. We got over the Springs, and it was clear. I looked down. I wanted to write Chuck a note. I spent the next hour writing him a note. I didn’t know whether I had a week or six months. I sort of put into context his influence on me. I found myself reflecting in that note, I don’t know whether he got to read it — he went in on Friday and I wrote it on Wednesday. How often I used him as a touchstone — how our relationship went from being two guys who worked together and fought constantly to two guys who talked two times a year, three times a year but nonetheless the extent to which I sought his counsel really hadn’t changed. That didn’t always manifest itself in conversation. Much as I do with my parents who have both passed, I would say to myself, ‘Chuck, what do you think about this?’ and mentally have this conversation with myself. It always helped provide clarity to me and it did that because he was so constant and so true to the things that were important to him that he believed in. There was never a different side of Chuck. That’s why his counsel, whether real or imagined, is so important to me. Chuck always went out of his way to say hi and to check if I needed anything and truly meant it. I know that Chuck took some pride that Missy and I were from Colorado where he called home. I had last communicated with him right after he announced his retirement. He was probably overwhelmed with emails and phone calls and yet he took the time to answer my email and said he hoped I was doing well and truly meant it. Chuck truly was a great person, father, husband, friend and CEO. There was no greater a friend to swimming than Chuck Wielgus. Always visionary, always thoughtful in his demeanor, and whether he was listening or not always made a person feel heard. We have lost a leader that will be hard to replace. But Chuck would have been the first one to stand up and assure us that another great leader will follow. And if it is one who has borne witness to this truly remarkable man in action, then we will be in good hands. For me, he reminded me of my swim coach, Richard Quick, in the ways that he was always positive. I never heard a negative word ever come out of Chuck’s mouth. Not once in the 20 years I knew him. He never uttered the words “can’t” or “won’t” or “don’t.” I call those the “-n’t” words. He was so utterly positive about everybody around him. If there was a negative, somehow or another, he would turn it onto a positive. For me, anyway, it was important personally — not that I had a lot of negativity in my life — when I first started at USA Swimming in 2003, you know, it was scary, I was moving my family, I had three kids at the time, we were making this huge move from Birmingham, Alabama, to Colorado Springs, and he made everything so seamless and so comfortable. ... He suffered. More physical pain than I have ever seen any human being suffer long-term. I have never seen anybody suffer like that. And he never brought it to work. Never. Never brought it to the people around him. He was always matter of fact: this is the hand I have been dealt, everything is going to be OK. If that were me, I would be the first one bitching and moaning. I would. I would want people feeling sorry for me. Chuck grew up in the town I have raised my family in: Larchmont,New York. The town’s swimming fame will forever be tied to both Chuck and the Badger Swim Club, which has developed many of America’s best swimmers. If I had lasted more than one summer at Camp Badger as a kid, my path may have crossed Chuck’s well before he joined USA Swimming. But when we met we found our true connection — the world-famous Walter’s Hot Dog. Walter’s is a historical landmark and Larchmont institution serving hot dogs to a long line of eager patrons since 1919. There is no better hot dog in the world. The “secret sauce” they refer to on their website, I’m pretty sure, is butter. We didn’t have a conversation without a reference to Walter’s, and how much we wished we were still young enough to down a few of those magical hot dogs. 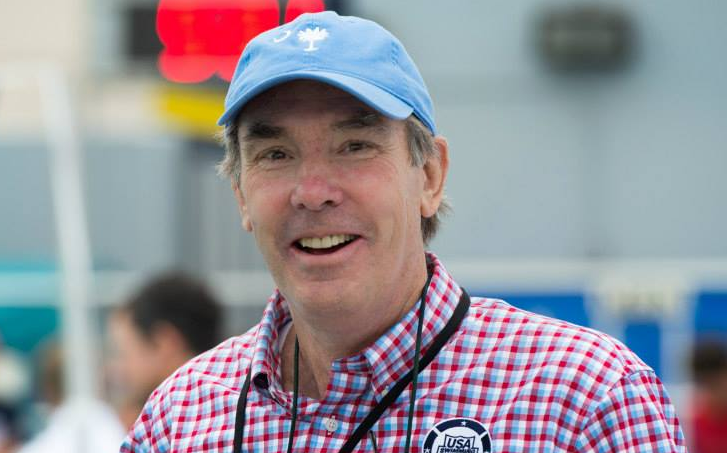 Chuck was a kind, generous and gentle man who will be sorely missed, but whose example for how to lead an organization committed to the development of a sport and its young athletes should be practiced every day by those striving for the success USA Swimming realized during Chuck’s tenure. I trust Chuck is now enjoying both a Double with the works, and what an inspiration he was and will be to so many. My heart is heavy for Chuck's family and those he impacted. In 2001, when he signed the deal with Mutual of Omaha, Mutual asked Chuck who should be the first Olympian to hire as a spokesperson. Chuck said, "You need to hire Josh Davis first." Sixteen years later, I'm still excited to be a good USA Swimming ambassador and help train others to do the same. I'll be forever grateful to Chuck for recommending me. Cancer met a formidable foe in Chuck, who in between regular and grueling medical treatments gave 100 percent for his work with US swimming. His marketing and promotional expertise elevated the sport from amateur status to a sophisticated level of professionalism, which attracted the highest of TV ratings for both the U.S. Olympic Trials and the Olympic Games. Additionally, his commitment for U.S. swimming to produce a film about the treatment of our 1976 women's Olympic swim team in respect to how the use of doping practices by the East Germans in Montreal robbed athletes of both countries of their dignity, idealism and health underscored his determination to right a terrible wrong. At the dinner 'celebrating' the launch of the 2012 'Splashmakers' book in New York, Chuck brought Alex Wolff in to speak at the dinner. Chuck and Alex were also hoops pals and, as you probably know, wrote three books together. In introducing Alex, Chuck called him something like "the best sportswriter I've ever known" or "the best sportswriter of our time." A week later, I got a handwritten note from Chuck, abjectly apologizing if I had somehow been “offended” by his introduction of Alex — who is also a good friend of mine, FYI. Naturally, I responded by saying that because of this terrible transgression, I expected him to pay me at least a dollar more for my piece in the next 'Splashmakers.' He did exactly that — sent me a one-dollar bill when the piece was finished, suggesting that by sending it in cash, it was actually worth more since I didn't have to declare it on my taxes. Chuck was running a community recreation program in a little town in Vermont. That’s how he came to the sport, as a recreation director who was dealing with kids and parents on a daily basis … and I hope he is judged by what he did affirmatively when the full extent of these things is laid bare. …He got so excited about something he came up with, this idea of taking the Woodstock, Vermont, swim team to Mission Viejo, California. He thought, where is the best swimming in the United States? And what if our kids in little Woodstock could get a glimpse of that? Even when he was starting out, at that level, he made it happen. They fundraised. They got there, and it was a culture clash — Woodstock, Vermont, against Orange County, California, particularly back in the late ‘70s. It was unheard of. Chuck always thought over the next hill, always had a wider field of vision than anybody else. …The thing about him is, at USA Swimming he wasn’t a CEO who helicoptered down into the position. He was somebody who came up from the very grass roots. … When we were young, in our teens and 20s, when I went away to be an employee of his — I was about 20 years old, Chuck was in his late 20s, we concocted the idea of doing a couple of books. We didn’t have any limits … it was always that attitude of, why not? He didn’t want to be boxed in by convention. At the same time, he could make his way through the conventional. Like, the board room or committee meetings. The blazers, you know, he could navigate that world. But he could step back and chuckle, no pun intended, and see something bigger or something human. It’s what Omaha has become. So many things. It was just this unwillingness to be boxed in by convention. …… One other thing about this match of Chuck and USA Swimming and Colorado Springs. He soldiered through 10 1/2 years of this disease. He did it because he was around high-performance people each and every day. He told me this. He saw athletes and coaches and trainers and nutritionists. He saw people who set goals. He was humbled by that. He was inspired by that. Ten and a half years of this disease. He was a big, strong guy. Cancer got the better of people bigger and stronger. For 10 1/2 years, he would go to work every day. He would see people pursuing stuff relentlessly and systematically and putting their trust in other people. And he would trust people — he was trusting his doctors, his family and his friends. Those relationships were just awe-inspiring. Chuck would be the first to tell you it was a privilege for him to be around those examples every day. To me, Chuck Wielgus was a fascinating man and a study in contradictions. He came across as a most unassuming guy, almost meek in his demeanor, but he was clearly a terrific leader. His ideas and management skills helped grow my sport to astronomical levels. He surrounded himself with hard-working, goal-oriented people, and he built a sense of empowerment, not entitlement, at the sport’s governing body. 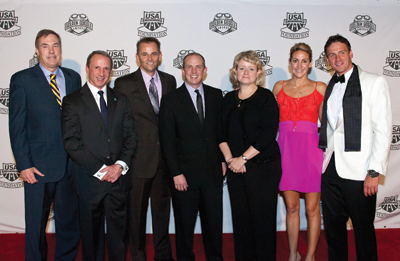 Chuck made the athletes, alums and volunteers feel like we were always an important part of the sport's mission. I will long remember his quiet devotion to his job, in spite of his lingering illness. He continued to travel and attend many events, even while enduring simultaneous debilitating treatments. I know of no NGB leader who was more admired and almost adored by his athletes. Chuck leaves a huge void in the swimming movement, but thanks to his leadership style, I have confidence that the growth he started will continue for many years. Though I knew about his serious health problems, I was deeply sad when I learned about the loss of Chuck Wielgus. Chuck was a true friend, a gentleman, with great ideas and a very strong vision for aquatics. He understood very early that sport is a business, and he constantly tried to promote it well. He knew that competition in the sport environment is rude, but he always found positive ways to market swimming and maximize the exposure and the visibility of its athletes. The amazing organization of the U.S. Olympic Trials, every four years, is a concrete example how he envisaged the power and attractiveness of our sport. 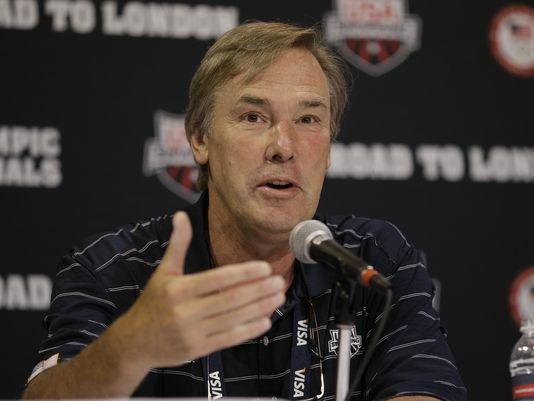 During his executive director tenure at USA Swimming, great stars in his country have dominated the recent editions of Olympic Games and FINA world championships. This was also due to his administration’s skills and to the positive work of his team at USA Swimming. Chuck was a man of convictions and he always thought that hard work would lead to amazing results. He was obviously right: that’s the key for success. Over these 20 years, we had of course many opportunities to speak together. I always admired his talent to understand the challenges, but, more importantly, to quickly find a solution to benefit swimming and its athletes. He was a very pragmatic administrator and it was easy to work together – he knew the strength of the U.S. teams, but also perfectly understood the universal character of FINA. I will sincerely miss him and as I wrote to his family some days ago, FINA stands beside them in this difficult and painful moment. Aquatics need more men like Chuck, but we will certainly proceed further guided by his example and devotion to our sport. I remember when I first became a professional swimmer and my agent and I were touring the halls of USA Swimming. I was directed into Chuck's office. I remember shaking his hand and (for me) finally putting a face to the name. Chuck smiled at me and said, "Cullen Jones, it's finally great to meet you.” He looked at my agent and said, "This guy is gonna change the sport of swimming forever." I still hold those words with me to this day. Fast forward. I am in a pretty bad rut because I didn't make the 2016 Olympic Games and was invited to [the 2016] Golden Goggles as a special guest for the USA Swimming Foundation. At [the] event, I saw Chuck. (We have had more encounters throughout the years than I can count, but this was different.) He looked at me and smiled at me the same way he did that first day in his office and without me even saying a word, he said, "Don't quit, there is more in you!" I just smiled at him. Chuck Wielgus was a visionary. He saw the huge potential for swimming’s popularity, created many ideas to broaden swimming’s interest globally and implemented his programs and strategies well. He was immensely popular because he worked within the system, while constantly pushing the envelope. Chuck took USA Swimming to another level, a level we can all be proud of. While Chuck would be the first to say that there is much more work to be done, he set a gold standard for all future CEOs of USA Swimming to follow. At different times in our lives, and early in Chuck’s career as executive director of USA Swimming, Gary Jr. and I independently challenged Chuck to make changes in USA Swimming for the better. To say that he came through with those positive changes is simply understating the fact. Today, swimming is arguably the most popular sport viewed in the Summer Olympic Games and much of that success is due to Chuck’s work. Much of the success of Team USA in swimming is due to Chuck’s work. The Hall family and The Race Club family wish to thank Chuck for his decades of hard work and dedication to swimming. We offer our condolences to the Wielgus family and will keep them in our prayers. For the scores of great American swimmers that the late Chuck Wielgus of USA Swimming knew, supported and developed friendships with, he knew one of America’s other great Olympians before he took over swimming’s leadership in 1997. As the executive director of USA Canoe & Kayak from 1989-96, Chuck was able to get close to and help develop Greg Barton, perhaps the USA’s top paddler in history. Barton, who was born with club feet, overcame his physical challenge by making three U.S. Olympic Teams (1984,1988 and 1992), on his way to become the most decorated U.S. Olympic Canoe/Kayak athlete in history. Barton won four Olympic medals in his sparkling career, a bronze in Los Angeles in 1984, two golds in Seoul in 1988 and a bronze in 1992 in Barcelona. He also captured two gold medals in the 1987 world championships and a gold medal in the 1985 world championships. When Wielgus was named in 1997 to succeed Ray Essick, already a legend in American swimming, I doubt that he could even dream of what lay ahead for him in the sport and what he would do to make U.S. swimmers the most powerful force in the world. As we know now, during Wielgus’ two-decade tenure, there were 156 podium performances by the U.S. Olympic swim team in five Olympic Games, including 33 medals (16 gold) at the 2016 Olympic Games in Rio de Janeiro. The medal count has equated to approximately 33 percent of the total Team USA count. I received the gift of knowing Chuck for most of his career at USA Swimming, and enjoyed his sense of humor, intelligence, passion and the way he cared for every man and woman who represented America at the Olympics and scores of other major meets. After I had retired from the USOC in 2003 and was hired by NYC 2012, New York City’s 2012 Olympic bid team, I returned to Colorado Springs in 2005 to step into another chapter of life. It was then that Chuck stood up and created something special. He created a monthly “Olympic Oldtimers” dinner for many of us who had served the Olympic Family in one role or another. These dinners were marked by great stories, inspiring memories, a lot of laughter and good drinks. It meant a lot to us, and Chuck knew it. He’s gone now, and so are those dinners, but not the memories of the man and his life, so treasured by those in a pool, wearing the Red, White and Blue. You remember Chuck Pagano — when he got sick as coach of the [NFL’s Indianapolis] Colts? They came up with bracelets that said, “ChuckStrong.” And somebody on his staff put the light on in his office and they left it on. Somebody wrote about that in the Indianapolis Star. I said, ‘This is perfect.’ This was 2012 or 2013. [During one of Wielgus’ medically related absences] I went to Chuck’s office and we turned the light on. He told me how much this meant to him. On [the] Sunday morning [he died], my daughter went with me and we turned his light on, which was a special thing to do. We put the light on. We need a mourning period. I think we’ll leave it on until his celebration. This morning, I came in and saw the light on. I don’t want to give people false hope but it’s an honor to him.